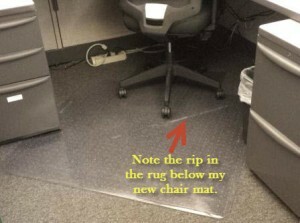 Does a Chair Mat Make Sense for your Office Floor? So, I was working in my cubicle the other morning and one of the administrative ladies of the company comes by with a guy who had a bunch of clear chair mats stacked up on a rolling cart. She looked into my neighbor’s cubicle and noticed that the gross rug that runs throughout our office building was torn just under his office chair. She asked him to move his chair out of the office while the guy placed a chair mat where his chair was located. What was cool about this chair mat was that it had a gripper back which allowed it to grip the carpet beneath it preventing it from moving. She then looked over into my office cubicle and noticed that my rug also had a rip just under my chair and asked me to move my office chair out of my office and the guy placed a new chair mat in my office. To be honest, I never even thought of getting a chair mat before but after using one for a few days, I really like it. I am fairly sure that the wheels of my office chair were occasionally getting caught on the ripped rug and now the wheels on my chair glide easily on the smooth surface. 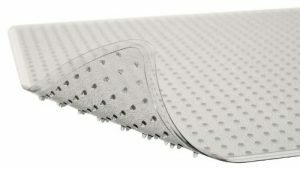 The one that I got is a Tenex Planet Saver Chairmat and it measures 45” X 53” and is made only for rugs due to the fact that it has a gripper back for carpets. The Planet Saver phrase refers to the fact that it is certified to contain a minimum of 33-percent recycled material. 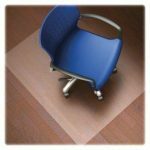 There are other chair mats that are made specifically for wood floors or hard floors to prevent damaging the surface of the floor from the wheels of an office chair (you can see a few further down in the article). 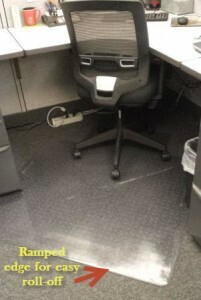 You can check out my chair mat in my office below. You can click on either image for a larger view. You can easily see how gross our carpets are and, as a result, they rip easily. My office chair wheels roll smoothly on the chair mat and grip very well without slipping. 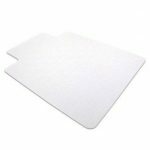 As I mentioned previously, there are other types of chair mats that are utilized to prevent scratching or scraping a wood floor. I think that these types of chair mats may be more common than the ones used to cover a carpeted floor. This may be more appropriate for a home office floor where there is hardwood. Some examples of various types of chair mats can be seen in the images below.